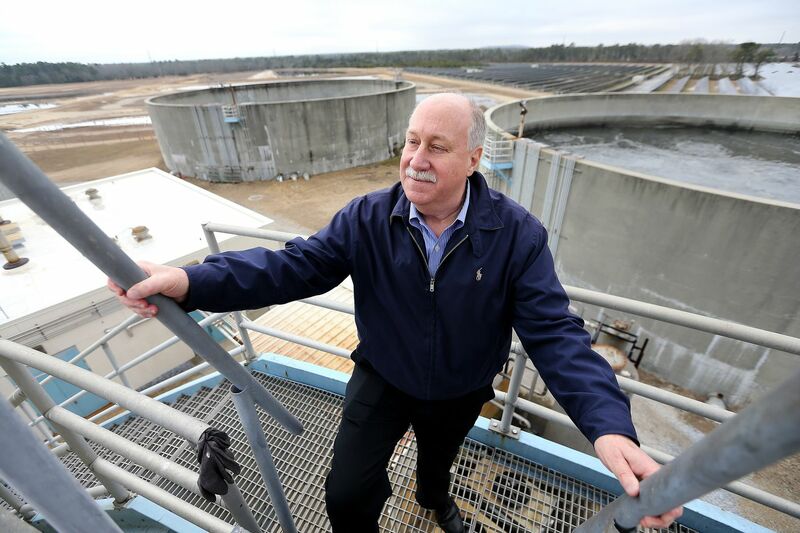 Dennis Palmer, executive director, looks over one of the sewage holding tanks at Landis Sewerage Authority in Vineland. From his perch 50 feet high on steel stairs, Dennis Palmer looked out over 1,800 acres of giant concrete tanks, solar-panel arrays, a forest, and a distant farm. What wasn’t visible, however, was an unusual source of power he uses at the sewage treatment plant he directs: meatball grease. Meatballs have become part of Palmer’s mission to wring every bit of power and money out of the process of treating human waste. Part of the operation uses grease from restaurants, convenience stores, fast-food joints and a nearby meatball-making facility to power a generator. “Grease is like rocket fuel,” Palmer said with a grin. The Landis Sewerage Authority, which services Vineland, Cumberland County, is unusual because it generates more power than it uses through a combination of technology Palmer has cobbled together since taking the helm in 1993. His sustainability recipe also includes pancake batter, soup mix, and even the leftovers at a fruit-juice plant. The authority also runs its own 400-acre corn, straw, and hay farm, fertilized by treated human waste, and brings in more than $100,000 a year in revenue just from the farm. Reusing waste is not new for sewage treatment plants. For example, since 2012, the Philadelphia Water Department has converted biosolids (industry parlance for treated sewage sludge) into germ-free pellets used as organic fertilizer or renewable fuel. It produces 50,000 dry tons of biosolid pellets annually. And the Delaware County Regional Water Quality Control Authority (DELCORA) makes money by charging haulers to take loads of grease from various facilities. But Palmer has installed a wide array of technology with the goal of making Landis one of the most environmentally friendly wastewater treatment plants in New Jersey, if not the entire region. A biologist and environmental engineer by training, Palmer hopes to achieve a near-zero carbon footprint and recycle or reuse all the byproducts that come from treating sewage. He once even tried to use 20 goats to control vegetation, but gave up after they proved too indifferent to the task in the heat. At 69 square miles, Vineland is just under half the size of Philadelphia, but is still mostly rural. That spaciousness has allowed the authority to experiment with all the land it owns. Palmer, who’s been in the business for 40 years, has made arrangements with at least five companies that specialize in taking away grease from restaurants and food processors including Wawa, McDonald’s, and meatball-maker Casa di Bertacha’s Vineland plant. “The day after Christmas, the trucks were lined up like a parade,” he said. The sewerage authority charges eight cents a gallon to accept the grease. In December, 56 trucks pumped in 191,631 gallons of grease, bringing in more than $15,000. The grease and other solids, including human waste, go into a bio-digester, sometimes called a mechanical stomach. It uses microorganisms to break down material, producing methane gas. The Landis Sewerage Authority used to burn off methane, a greenhouse gas, into the atmosphere, contributing to climate change. Now, the methane is captured and piped to a co-generator, where it is ultimately converted into electricity that heats water for use in the plant. The energy provided by the grease, which also comes from residents’ homes, accounts for about 15 percent to 18 percent of the sewage treatment facility’s needs, Palmer said. Wind and solar are other sources of energy the authority uses. Palmer concedes a single wind turbine near the authority’s headquarters on South Mill Road only generates enough to help power the office. But the nearby solar array, spread over two fields totaling 40 acres, provides a much bigger boost. Its output is about 8 megawatts, twice that of the well-publicized solar array at Lincoln Financial Field. The solar field is bordered by 10 acres of Atlantic white cedar the authority planted. Palmer’s black SUV bounced along a rutted dirt road as he pointed out 70,000 Southern yellow pine trees the sewerage authority planted as part of its forestry program. The facility owns 150 acres of pine forest, which Palmer said helps remove carbon dioxide from the atmosphere. The trees will be harvested for timber in about 25 years, another revenue-producer. In all, the authority owns 1,155 acres of forest. “The forest needs to be tended like a garden,” said Palmer, who has contracted with forester Bob Williams to manage the land with measures such as prescribed burnings to keep down tinder and invasive species. Palmer said one such burned area has transformed into a “grassland savannah,” just off Route 55. Wild turkeys, deer, and woodcock hide amid the forest and grasses, using the nearby Maurice River as a water source. The U.S. Department of Agriculture has certified the authority’s forestry plan. The authority also operates a 400-acre farm where it grows hay and straw it sells to horse farms and landscapers in New Jersey, Delaware and Pennsylvania, Palmer said. Feed corn for chicken and cattle also is produced on site, Palmer said. The authority bought the land from Wawa in the 1980s. Now, the farm is fertilized by biosolids from the treatment plant. The farm is experimenting with growing teff, an ancient grain from Africa. In all, farm operations bring in $120,000 a year in revenue, Palmer said. Farm employees get bonuses based on sales. The authority releases cleaned wastewater onto its land, but adds an extra step to clean out ammonia and nitrates. After the first two regular treatments, it undergoes a third to remove ammonia and nitrates. Following that, the water is pumped onto basins of depressed land that act as yet another filter as it percolates into the ground. The goal is to protect the Maurice River — which borders the property and empties into the Delaware Bay, making it part of the Delaware River watershed. Palmer said his facility needs about 11,000 megawatt hours on average a year. It produces almost 13,000. At a recent conference of the Partnership for the Delaware Estuary, Palmer explained his facility to a crowd of environmentalists who applauded his efforts toward the partnership’s goal of protecting the Delaware River and Bay. Other sewage and water treatment facilities, such as those of Gloucester and Camden Counties, are also making big steps in sustainability, he pointed out. "But we are the only ones I know of doing it soup to nuts,” Palmer said. His commitment to environmental causes is such that he even applied for and received a grant to install two electric vehicle charging stations, though no one working there has an electric car. Palmer hopes that will change.